Yellow perch, also known as lake perch, has a mild, sweet flavor with firm, flaky white flesh. It has slightly more omega-3 fatty acids (EPA and DHA) than Atlantic cod. Yellow perch size can vary greatly between bodies of water, but adults are usually between 4-10 inches in length and weigh an average of 5 ounces. Though usually served as fillets or in sandwiches, the small fillet size allows for many preparations. Several studies have found that consumers cannot distinguish any difference in taste between wild yellow perch and farm-raised yellow perch. Currently Wisconsin commercial fishermen are only allowed to fish for yellow perch in the waters of Green Bay, and most of this catch is harvested using gill nets and sold to local restaurants and fish markets. While a few tribal fisheries exist around the Great lakes, most wild Great Lakes yellow perch sold in grocery stores is caught in Lake Erie by Canadian fishermen using gill nets. In Wisconsin, yellow perch are raised either in outdoor ponds or in indoor recirculating systems. Some farms are beginning to use yellow perch in aquaponic systems as well. 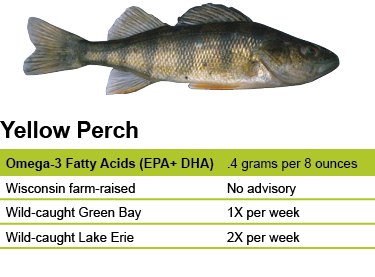 There is no consumption advisory for Wisconsin farm-raised yellow perch. State health agencies have found that it is safe to eat Green Bay yellow perch once a week and Lake Erie yellow perch twice a week. If you are unsure of the origin of your purchased fish, follow the most restrictive recommendation (once a week). Yellow perch are very resilient fish that tolerate low oxygen levels, so they were able to move into areas of the Great Lakes that developed poor water quality from expanding industries. For example, by 1885, they were found commonly in southern Lake Michigan and in Green Bay where once whitefish, lake trout and sturgeon made up the largest part of commercial catches. Because of their abundance and mild taste, they became a mainstay of the traditional Friday night fish fry enjoyed by many Wisconsin families at taverns and churches. In the last few decades, the number of Lake Michigan yellow perch has fluctuated dramatically. The population in the southern basin of the lake increased dramatically in the 1980s, along with a corresponding increase in the sport and commercial fisheries. However, a large decline in numbers happened in the 1990s, leading Wisconsin to close its commercial yellow perch fishery on Lake Michigan in 1995. Currently Wisconsin commercial fishermen are only allowed to fish for yellow perch in the waters of Green Bay, and most of this catch is sold to local restaurants. Wild Great Lakes yellow perch sold in grocery stores is usually caught in Lake Erie by Canadian fishermen using gill nets. Unlike commercial fishermen in the Great Lakes, those in Canada are subsidized by their federal government. While there is no definitive explanation for the decline of Lake Michigan yellow perch, many scientists blame the invasive species that have changed the lake’s food web. It appears that few young perch are surviving to adulthood, and this could be from invasive zebra and quagga mussels removing the food that young perch eat. Another factor could be that cormorants, birds that increased in number as Great Lakes water quality has improved, prefer to eat yellow perch. Due to the decline of wild yellow perch in Lake Michigan, the UW Sea Grant Institute began funding research in 1973 to determine how best to raise yellow perch using commercial aquaculture systems. Since then, staff have provided technical assistance on water quality and broodstock viability to private businesses and, more recently, to Growing Power, a nonprofit urban farm in central-city Milwaukee. The farm supplies fish and vegetables to local markets and restaurants, and it enjoys international attention as a leader and model for others worldwide who want to emulate its integrated food production system known as aquaponics.